Get a free activity chart now! Ribena Plus asked parents and kids across the UK about how active they are, and the results were great. Half of parents in the UK think that their kids are more active than they are day to day. And one in five parents even think their kids are more active than they were at that age! Click here to find out more about the research! 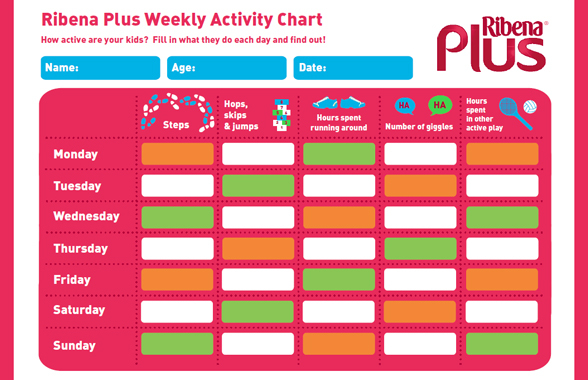 So you can measure just how active you are, we’ve got hold of a free activity chart for you to download and print off. It measures how many steps you’ve taken, how much running you’ve done and even how much giggling! CLICK HERE TO DOWNLOAD THE CHART!